Basically lung cancer is known as bronchogenic carcinoma or bronchogenic carcinoma is considered as an origin of lung cancer. As the name indicates, it is the cancer i.e. carcinoma which occurs in bronchi of lungs i.e. bronchogenic. Bronchi are the largest airways of the lungs. Bronchogenic carcinoma have two main types 1st one is small cell lung cancer and 2nd one is non small cell lung cancer. In small cell lung cancer, cells are observed under microscope and in non small cell cancer, cancerous cells are bigger in size and further divided into large cancerous cells, squamous cell carcinoma and lung adenocarcinoma. Symptoms of bronchogenic carcinoma resemble symptoms of other lung cancers. Symptoms of brochogenic carcinoma are related to cancer cell growth in bronchi. Commonly bronchogenic carcinoma shows blood in cough, airways get obstructed due to tumor and lead to recurrent pneumonia and persistent cough. Now a days lung adenocarcinoma (a type of bronchogenic carcinoma) is found to be most common lung cancer. It is present in about 40 to 50 percent of cases of lung cancer. So symptoms regarding lung adenocarcinoma are frequent weight loss, weakness, fatigue and shortness of breathe specially when patient do workout or exercise. Unfortunately, bronchogenic carcinoma have poor prognosis. Survival rate is very low that small no. Of people survive with lung cancer. People with bronchogenic carcinoma survive only 5 years. Only a few people (almost 17 percent) with lung cancer survive more than 5 years. Prognostic data varies according to the type of lung cancer and stage of cancer. Chances of survival at early diagnosis of 1st 2 stages are greater. 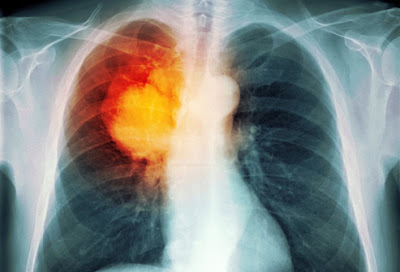 Treatment of lung cancer is still improving for increased survival rate. Chemotherapy is improving day by day to make it more effective even at 4th stage. As 4th stage is deadly stage and no one recover from that stage. Treatment option is selected on the basis of several factors. These factors involve stage of cancer and type of lung cancer. Diagnosis is really important in selecting treatment. Diagnosis will confirm the type and stage of lung cancer. People who take treatment i.e. chemotherapy and also take care of their health by following precautions have greater survival rate. Other than chemotherapy, surgery of target cancer site, targeted therapies and immunotherapy are involved. Radiation therapy is least recommended because it do harm healthy cells too and can make patient more ill.